This is a demo for SHSAT Math but the questions are not necessarily suitable for you. What is the value of 2020200/20 ? When expressing 1/11 as a decimal, you get 0.0909090909090909..., what is the 24th place to the right of the decimal point? The following sequence of numbers are placed in the table as shown. Note that each number in the sequence is an even number. If the pattern continues, in which column will the number 372 appear? If X = 9/10 , Y = 10/11 and Z = 42/50 , which of the following is correct? P, Q, R,and S are on a number line with S not shown in the below graph. The length of RS is 4 times the length of PQ. What is a possible coordinate of point S? 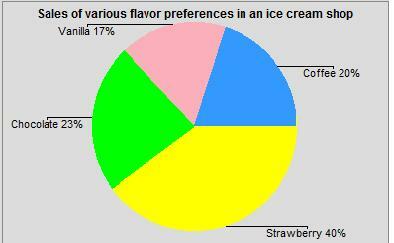 The graph below shows the sales of various flavors in an ice cream shop. If 40 Coffee flavor ice creams were sold, what is the number of Chocolate flavor ice creams sold in the shop? If each of the fractions 2/X , 3/X , and 4/X is in its lowest terms, which of the following could be a value for X? P and Q are natural numbers and P + Q = 15. What is the largest possible value of 1/P + 1/Q ? All the three sides of a triangle have integer lengths. If one of the sides is 20, what is the smallest possible perimeter of the triangle? If a@b means (a + b) /5 , then what will 25@(24@26) = ?
 . (8) - .000(1) = ? ABCD is a rectangle. E, and F are at the same height. If the area of the rectangle ABCD is 54, what is the area sum of the shaded triangles? In the figure below, three vertices A, B, and C of a quadrilateral fall on the circle circumference and the fourth at the circle center O. 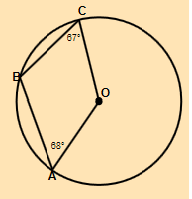 The measure of angle BCO = 67° and BAO = 68°. What is the measure of angle ABC? A) 145° B) 135° C) 140° D) 120° E) It cannot be determined from the information given. Nick sells candy bars at a tailgate party to raise money for his school sports club. The candy bars are sold at 3 for $2, and he brought them at 5 for $1. How many candy bars must be sold in order to raise $21? ABCD is a rectangle and DEC is a triangle. If the degree measure of ADE : AED : BCE = 2 : 4 : 1, what is the degree measure of DEC? Note that the diagram might not be drawn to scale. 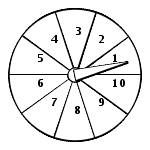 A spinner shown in the diagram has 10 equal sections. The probability of the pointer falling into each section is the same (Assume the pointer will never fall on a line between two sections). What is the possibility that the product of the two numbers that occur in two tries is a prime?